The Lord Ayyappa Temple at Kulathupuzha near Thenmala in Kollam District of Kerala is an important shrine visited by Ayyappa devotees especially during the Mandala-Makaravilaku season. 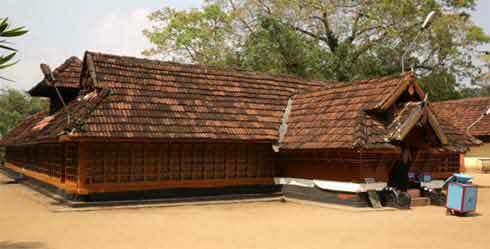 This Shasta shrine is located on the banks of Kulathu Puzha, a tributary of Kallada River, and is in the reserve forest. The deity here is Manikantan or the child form of Lord Ayyappa. The deity is popularly referred as Dharma Shasta. There are two main deities in this small temple – Lord Shiva and Shasta. Shiva is in the form of Shiva Linga and that of Shasta or Ayyappa is a stone image. The shrine also houses an elaborately carved idol of Lord Vishnu. There are also shrines of Ganesha and Devi in the compound. There is an interesting legend regarding the origin of the Ayyappa Temple at Kulathupuzha. Once and elderly Brahmin returning from his Rameshwaram pilgrimage camped on the Kallada Riverbank. His servants started the preparation for the evening meal and they looked out for stones to create the makeshift oven. They found a fixed stone nearby and brought two stones to create the oven. But the fixed stone was bigger than the two stones. The servants placed two stones on top of other to adjust the height. Suddenly, the first stone grew a bit taller. The poor servants raised the level of the two stones again but the fixed stone again grew a bit taller. This exercise of adjusting the height continued for awhile. Finally frustrated with the fixed stone, one of the servants hit the fixed stone with another stone. Suddenly blood gushed out of the fixed stone and the scared servants ran and reported the matter to the Brahmin. The Brahmin sprinkled some tirtha (sacred water) brought from Rameshwaram on the bleeding fixed stone. Soon, Lord Ayyappa appeared in the form of child before the Brahmin and his servants. The local chief who came to know about this incident built at temple for the deity. Kulathupuzha town is situated on the Thiruvananthapuram - Shenkottai road. Kulathupuzha is 60 km north-east of Thiruvananthapuram and 64 km east of Kollam. Another nearby Ayyappa Temple is the Aryankavu Sastha Temple which is around 25 km north of Kulathupuzha. Further north is another famous Ayyappa Temple - Achankovil Dharmasastha Temple. How to do the Irumudi kettu?